Last year was my first year with this blog and I talked about the differences between a Japanese Christmas and a Western Christmas. It’s a little early for Christmas, but with December having started already, it’s the holiday season. The actual Christmas season starts on November 1st, and gets into full swing on December 1st. It also signals the party season. If you have ever visited Japan in December, it’s highly advised that you be careful when taking the trains after 10pm. In fact, you should always be careful after 10pm. It is this time when people start to make their way home after a night of drinking. 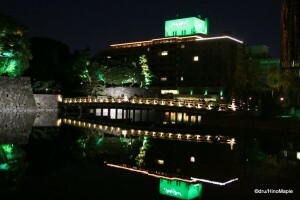 The end of the year is a very important time for Japanese people to celebrate the end and have one last party. Bonnenkai is essentially a Christmas Party, or for non-secular people, a Year End Party. Offices typically have at least one party at this time, but depending on the company, this can increase significantly. In North America, there tends to be an average of three Year End Parties, at least from my own experiences. There is usually one for the department, one for the company, and possibly one with friends. Sometimes, this is the only time to meet old friends as people can be busy with their work and their own personal lives. On the extreme end, people could have up to three parties each week, or about 12 in the month if they have to have a bonnenkai with their customers. Needless to say, this can put a lot of stress on a person’s liver. Typically, restaurants are busy over the weekend, and there are always special bonnenkai deals to be had if you book ahead. Be aware that sometimes they are not better than ordering on your own. Other than bonnenkais, the only thing that happens during the holiday season is to head around town and see all of the Christmas lights. It has become very popular for different shopping areas to have their own light display. 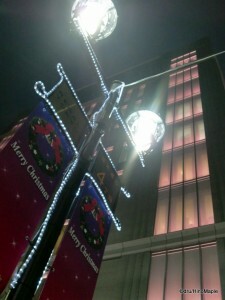 As always, Ginza is a hot spot for lights, although it’s not spectacular. Roppongi is generally a more interesting area as they have the Tokyo Midtown, the Roppongi Hills areas for lights. 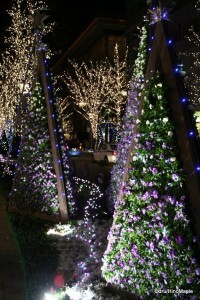 This year, there will also be another Lightopia event in Marunouchi along with the typical Marunouchi lights. 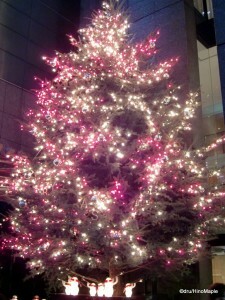 If you have seen the Christmas lights in the last few years, especially in Tokyo, there won’t be too many new displays. Each year, there tends to be one major new light display, while the others are only slightly updated. The general designs tend to be the same. Below will be a link showcasing the major areas where you can see some lights. Note: The three boxes in the key are, in order, “There is a Christmas Tree”, “There is an event”, and “There are fireworks”. Unfortunately, the events will depend on the location, and I am not sure when the fireworks might be. There are only three places where there are fireworks: Tokyo Dome (December 14th at 7pm for about 3 minutes), Toyosu Lala Port (December 24th at 8:10pm), and Tachikawa’s Showa Kinen Park (December 19th and 24th at 8pm for about 5 minutes). Note: All sites are Japanese unless specified. If you are curious about locations in a specific area, please feel free to ask with a comment. I’ll do my best to provide a small list based on these sites. This entry was posted in Christmas, New Year's and tagged Art Intelligent, Artelligent, bonnenkai, Christmas, Christmas Illumination, Christmas in Japan, Christmas Lights, christmas party, fireworks, Ginza, Happy Holidays, Holiday Season, Holiday Season in Japan, holidays, Illumination, japan, Japanese Christmas, Lalaport, Lightopia, Marunouchi, office party, Roppongi Hills, Showa Kinen Park, tokyo, Tokyo Dome, Tokyo Midtown, Toyosu, Year End, year end party, ぼねんかい, イルミネーション, クリスマス, クリスマス イルミネーション, クリスマスイルミネーション, 中央区, 丸の内, 六本木, 六本木ヒルズ, 千代田区, 日本, 東京, 東京都, 港区, 花火, 銀座 by Dru. Bookmark the permalink.